It's nice that companies are now trying to figure out ways to take virtual gaming to real world stuff, like this Anki Drive that I keep reading about on the interwebs. If you haven't heard their remote control cars are so great that it even impressed Tim Cook enough to let them present their product during Apple's WWDC event. 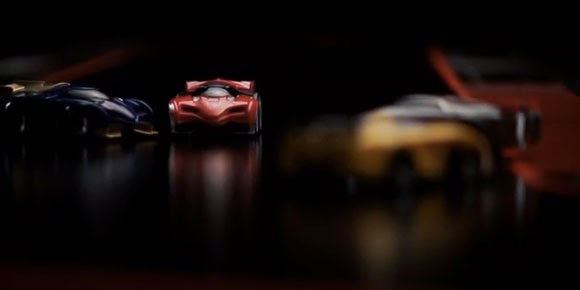 From what my small brain can understand, these small cars are so smart you don't even need rails or anything of that sort to race around the play mat. And it even comes with it's own iOS app where you can control and shoot the other cars. Anyways, it's fun and all but I don't think it will immediately be available here on our side of the world and from what I heard it's gonna be a hefty USD 200 or something like that to get the starter kit. Which I'm sure is way too much for most parents to buy their kids specially when you have tablets lying around with the same price point. Anyways, just go ahead and check it out after the break and hope that we get some kind of invite to try out the Anki Drive Starter kit.